Capability. You need to be very competent at what you do. But capability alone won’t give you a fabulous reputation. Harvey, after all, is acknowledged as one fo the best movie producers in the world. You also need to have Character. You have to be known to ‘do the right thing.’ Here Harvey fails. We also all know people who are ‘wonderful, wouldn’t hurt a fly, salt of the earth’, but not good at what they do. Their reputation suffers. We like and respect them, but would never hire them. To keep succeeding in careers, we must work on our ‘trust’ fitness with all the stakeholders we must work with and whose view of us is important. Remember the human condition. It is so easy to slip, and to let ‘trust laziness’ creep in. Happens to me all the time. You’re not born with all the ‘trust’ characteristics. You can learn, build and evolve them. So here’s a quick Trust Health Check for you. Look at each statement below. Give yourself a mark for each question. Full marks for that question if you are outstanding at this with your clients and internal stakeholders. You’re brilliant. Could not be better. Zero if you are an unmitigated disaster at this. And somewhere in between based on how you feel you are. You know the plot. Then add up your scores. Get a total score out of 100. I explain at the bottom what your score means. Give it a go!!! I work hard to build a professional profile for myself based on sharing insights about what my clients are most worried about. I focus on their issues and concerns, rather than talk about myself or my firm. My brand building positions me right at the edge of the disruption impacting my clients. I quietly share examples of how I am delivering powerful results for others my clients admire and respect. Never breaking confidentiality of course… but seeding examples that show I am at the edge, sharp, kicking goals and adding value. I never lie to clients. I am up front and authentic. I tell them bad news, fast. Yes, I do of course manage perceptions carefully, but always with candour – truth without malice. Of course I stuff up occasionally, and drop the ball. But when I do, I tell the client immediately, apologise, and set new deadlines and commitments. I recover fast from my setbacks. Now, add up your score. When I was at university, 80% and above was a distinction. 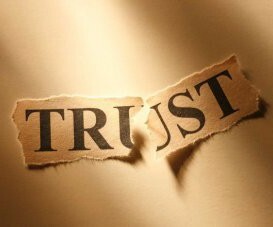 In the world of Trust, to me there is no compromise. Now, stay calm. If you score less than 80%, what a great learning! Take action NOW to start improving your scores. Print out the Trust Health Check. Look at it regularly. Keep self-assessing. We must every day ensure we are doing the hard yards to strengthen the pillars that create a brand for ourselves as being trustworthy. It needs focus. Dedication. Consistency. It’s so easy to slip up. We simply can’t afford to do that. Work on your Trust fitness just as you do on physical fitness….with a plan, focus, measuring results, consistency, determination and grit. You’ll stumble on that Trust journey, just as you do on a jog. That’s okay! Just keep at it, you’ll soon be running marathons! 8 Responses to The Trust Test: Do You Pass, or Fail? That would be seeing, not saying. Strong, Chris. My Dad would say “Character is the tree, reputation is the shadow” (Lincoln, I think). Maybe capability is the leaves!